"I've nearly cracked this," I thought. Oh how wrong I was. 5kms away from the top of Europe's longest climb, lungs busting, legs aching and my mind feeling the weight of the challenge ahead. 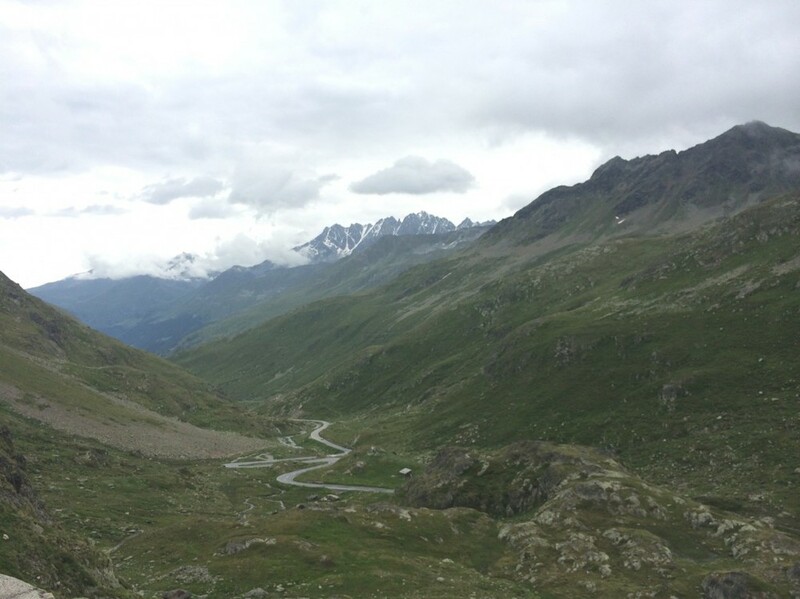 At 28kms long, the Grand Saint Bernard, a Hors Category 1 climb with 2000m of climbing is a tough cookie to crack. I was in good spirits when I started the climb and I was in good spirits when I saw the sign saying 5kms to the top. The sun shone for the first (and only) time in the entire ride, I put my sunglasses on and smiled. At the start of this climb with 116kms in my legs, I was one third of the way through the Tour du Mont Blanc - regarded as the toughest single stage high mountain cycling event in the world. The challenge was to cycle 330kms, 8000m ascent over 8 high alpine passes, through 3 countries in one day. GULP. Described by the organisers as the equivalent of cycling the Marmotte twice (they organise both events). Only 4 women have ever completed it, could I be one of them? We were still faffing with kit. Lights not working, bags all over the place, water bottles unfilled. Damn. At least it's not raining... the forecast at the briefing the night before had been pretty dire. Thunderstorms, rain, wind, the worst weather day of the summer in the Alps. We made it to the start line just in time to join the back of the pack and head off into the darkness. "It's pretty much downhill for the first 70kms," a fellow cyclist told me. I knew this was an Alps-tinted description as that part of the route passes by my new home in Chamonix and I know the hills around there. The magnitude of this event means the climbs up the Col du Joux (3rd category climb) and Col du Vaudagne (2nd category) are largely regarded as insignificant and aren't mentioned in the race briefing. By the time I arrived at the summit of Vaudagne, I was already at the back of the pack and feeling it in my legs. It was well and truly morning and I could see the dark, heavy clouds gathering in the direction we were headed for. 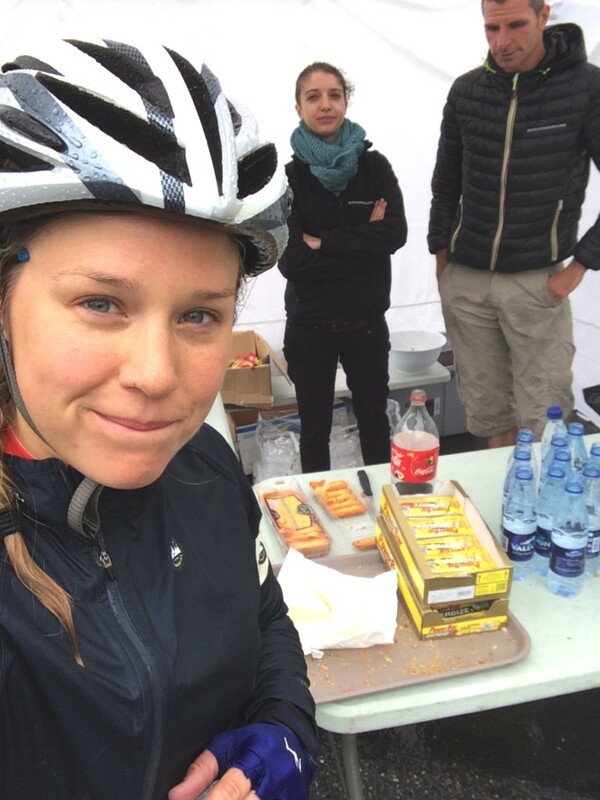 At the top of Col des Montets 78kms into the event, the rain started and I learned that my jacket wasn't waterproof. "It's ok, water doesn't hurt - so long as I keep moving I'll stay warm (ish) and be ok"
I crossed the Swiss border and headed towards the next climb. I knew this route well and settled into a rhythm. I had a brief moment of company climbing up the Col du Forclaz, a lovely British guy. We got deep into a coversation about social media, took my mind off things. The 10kms long and winding descent descent from the Col du Forclaz with 1000m drop down to Martingy was hairy. The rain was so heavy and biting away at my face, knees and any other exposed skin. I opened my eyes one at a time, just enough to see the road. My hands became numb. I stayed focused on the road, trusted my bike and brakes. Through the rain I saw an accident, ambulance and a bike without a rider. I knew the next feed station wasn't far away, excited by the thought of the 'savoury' food they had promised to be there, I pressed on. 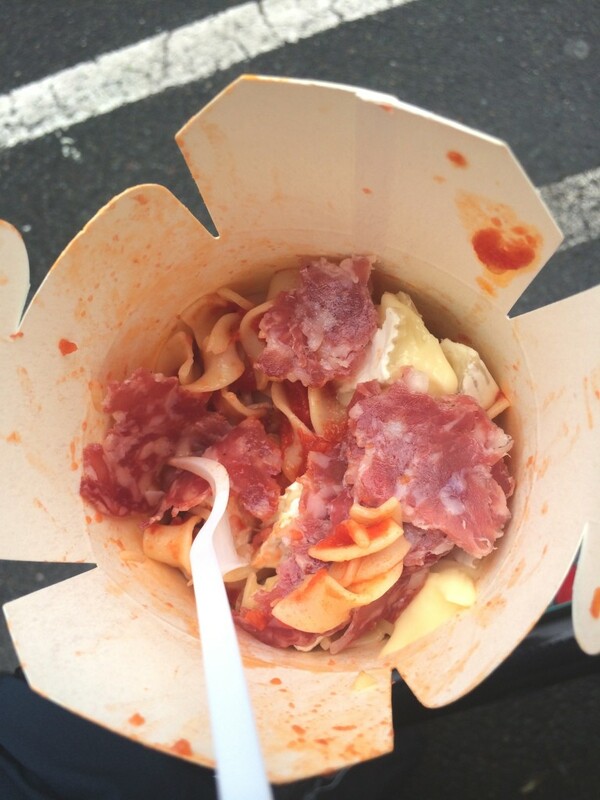 At 116kms I arrived, disappointed to see the only savoury food was Camembert! I crammed 4 or 5 madelines into my mouth, drank a cup of coke, refilled drinks bottles, ate apricots and a piece of Camembert before heading out into the rain again. The vacant look on my face and the other cyclists at the feed station was compounded by the arrival of injured cyclists in support vans. Draped in foil blankets, some bandaged, others warming up in the van, all men. I didn't see any women throughout the whole race until the very end when I saw one very strong lady! Two hours later, I was still climbing. Onwards and upwards, "keep spinning the legs", I used everything I had to stay positive and dig deep. After a 6km tunnel I came out onto the old road and felt like I was nearly there. Oh how wrong I was. The remaining 5kms had an average gradient of 9% with some sections +10%. The weather closed in and the mountains felt cold and harsh. I could feel the loneliness of this ride in full force. I had to stop a few times. Strange conditions to cycle in with very cold air as I reached the top at 2500m, but my heart rate was high and sweat dripping down my back. Upon reaching the top I was in a total white out. It was freezing. I couldn't find the feed station. I got off my bike and had a moment. I felt hungry but tired of eating bars. I remembered the emergency Reese's peanut butter cups my Mum had given me. I found the Reese's PB cups and thinking of my Mum, burst into tears. I was finding this really tough. "I'll just eat one", I thought - I demolished the whole packet. Armed with PB, I was back on my bike and 50 metres away found the feed station. I ate warm tea, crackers with more Camembert and apricots. I put on my winter gloves, hat and neck buff. Already shaking from the cold I began the descent into Italy. 40kms of descent should have been a happy experience. It was terrifying. I read a text from a good friend; "soak it up, accept everything, let the emotion flow". I don't think I neeeded any encouraging, I sobbed for the first 2okms of the downhill. I knew it would get better, I knew I'd warm up and I hoped I'd be safe. An hour later, I was cruising through Aosta and headed towards the next big climb. Buoyed by the feeling of being nearly broken but overcoming it, I pressed on. As I came to the next feed station, I hit 206kms on my Garmin and clocked 2/3 of the way through the challenge. Come on, you can do this! By this point there was only one cyclist behind me - an English guy. Many others had decided to call it a day for one reason or another. In the end less than 50% of the participants actually finished the race. Luckily, someone at the feed station had warned me that despite it's name, this was a big climb. With over 1000m of ascent over 20kms, it seemed to go on forever. The day was starting to draw to a close and the temperature began to drop. The support cars were keeping a close eye on me. Expecting me to drop out at any point, I kept pushing. Roughly 40 minutes from the Col Petit Saint Bernard at 2188metres, the thunder crashed right above my head. I knew immediately the thunderstorms had arrived and what was about to happen. Thick, heavy rain drops descended, instantly drenching everything. To begin with, I quite enjoyed it. There's nothing like being out there on your own battling the elements! I can't pinpoint the exact moment I decided to call it a day. I think it was an acummulative effect. I knew the 25kms from the Col into Bourg Saint Maurice would be dangerous. I knew the final leg in France would be one push too far. I felt I'd already achieved enough. I had nothing left to prove. I wanted to get warm, dry and have a beer. 14 hours, 230kms and 5,500 metres ascent, it was enough for me. Wrapped in a foil blanket and sat in between two of the race organisers in the van, I let myself take it all in. Driving the remainder of the route back to Les Saises, people were dropping like flies. One man was prised off his bike and put in the van next to me. His lips were blue, he couldn't speak. Another man was zig-zagging across the road but refused to give in. 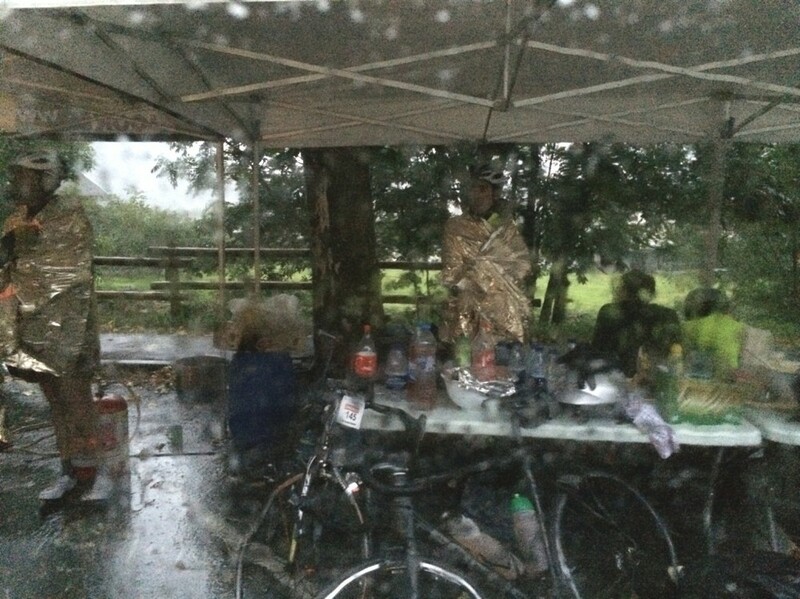 At every feed station, cyclists were waiting to be transported back to Les Saises. I am in absolutely awe of those I saw still in high spirits, pressing on into the night, focused on completing the Tour du Mont Blanc. Out of 350 participants, 150 finished.